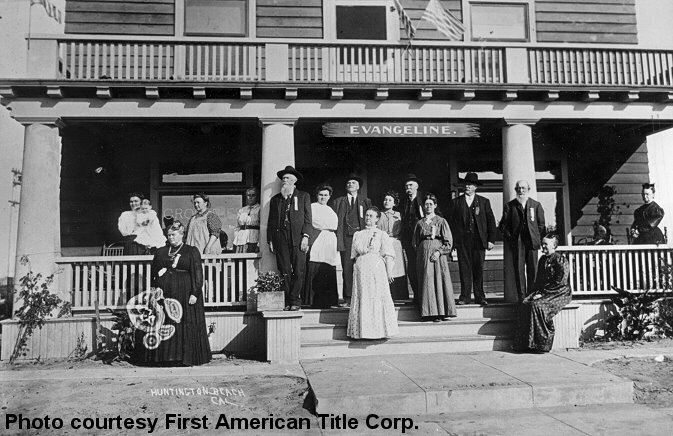 Anniversaries are a good time to publish local histories. Huntington Beach got Joe Santiago's Ebb & Flow for its centennial, for instance. Well, this month the City of Aliso Viejo turned 10, and sure enough, here comes a new book. 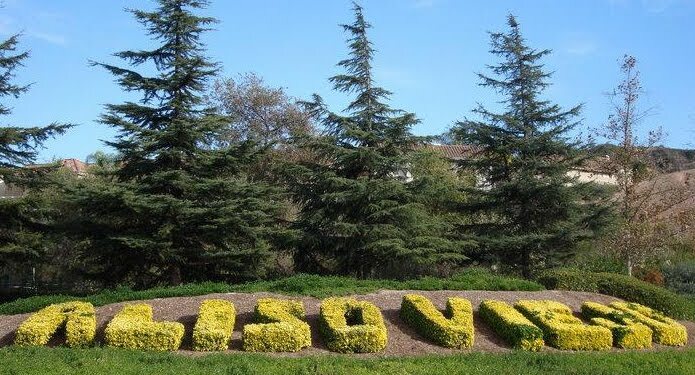 Images of America: Aliso Viejo by Bob Bunyan and the Aliso Viejo Community Foundation comes in at 128 pages, total. Of those, only 13 pages deal with that particular chunk of land from pre-historic times up through the 1960s. And of those 13 pages, almost half the space is taken up with modern images of Acjachemen village re-enactments. 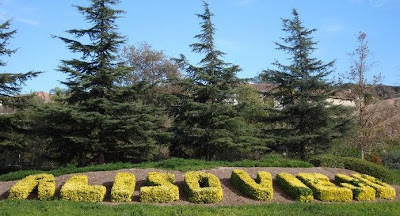 Of the remaining 115 pages, 28 deal with the activities of the Mission Viejo Co. in the 1970s and 1980s. The rest of the book -- that is to say, the majority of the it -- deals with Aliso Viejo proper, from development in the 1980s and 1990s through today. I'll leave it to you whether or not this counts as history yet. But if you love Orange County's newest city, and want a keepsake, this is your go-to book. The photo above shows Judge J. E. Pleasants in about 1900. I briefly discussed him in my last entry and said that "Much, much more can be said about Pleasants, but that's a whole 'nuther post." Some wiseguy soon responded, "...Get with it and follow-up with articles on 'the judge.'" That was already my intention. But the more I dug into the story, the more I realized that to do any kind of justice at all to the man's story, one would need to write a book. So I've started a Pleasants file, and maybe the book will happen someday. Short of that, I offer you this link to a biographical thumbnail sketch and timeline, from the finding aid for the Pleasants Family Collection in UCI's Special Collections. For a small sample of the kind of colorful stories omitted by such summaries, I offer the following tale, told by Pleasants and quoted in Terry Stephenson's Shadows of Old Saddleback. The story took place in the 1860s, when Pleasants was foreman of the Rancho Lomas de Santiago. "In the upper Canada de Las Ranas [a.k.a. Peters Canyon], the Precitas [Canyon] and the Limestone [Canyon], a pack of seven big timber wolves pestered our stock. ... Among the vaqueros was one of Spanish descent named Aramente who had a 7-year-old son named Stanislaus. One evening the boy was sent afoot by his father to bring in a horse. ... The boy found him feeding on the plains out where the golf grounds were afterward located. Stanislaus caught the animal, but was unable to mount him, so with his little dog trotting along beside him, he was leading the horse toward home... when the pack of wolves swooped down off the hills and rushed at him. By waving his arms and by his cries, the little fellow kept the wolves off. They ran round and round, jumping at him, snapping their jaws. They would have killed the boy, I am sure, if the dog had not intervened. That plucky little dog got his teeth in a wolf, and the whole pack turned on him. While the wolves were killing the brave dog, the boy ran toward home. "Becoming anxious over the failure of Stanislaus to return... Aramante and I rode out to look for him and had just reached the crest... when we saw the boy running toward us nearly exhausted and in a terrible fright. The wolves, sensing our approach, had turned and we glimpsed them fleeing over the hills." Who knew Orange County had wolves? Of course it doesn't anymore. After this harrowing experience, the pack of wolves was made "enemy number one" on the rancho and didn't survive long. And we've heard of no local wolf sitings since. I tell you this to ease the concerns of those readers who may have built their condominiums out of straw or sticks. I recently visited Helena Modjeska's home at Arden. (If you haven't driven out to see it, please do. It's now one of Orange County's Historic Parks, and definitely worth scheduling a tour.) 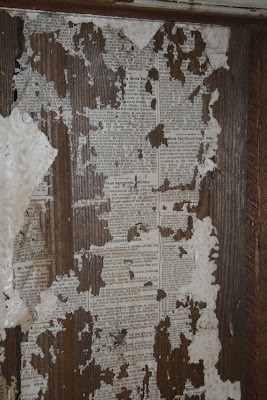 One of many curious things that caught my attention was a closet where most of the wallpaper had come off, revealing old newspapers underneath! Hardly anything is as historically interesting as old newspapers, but it's damned near impossible to read them upside-down and backwards in a dark closet. With that in mind, I asked for permission to photograph some of the closet walls so I could decipher them later. Today's images both come from that set of photos. Garrett shot Billy the Kid on July 14, 1881. So the paper was probably printed shortly after that date. The reference to the Gazette makes me wonder if this was a copy of the Anaheim Gazette, which seems likely. Someday I should check it against the microfilm at the Anaheim History Room. In any case, this scrap of newspaper also included the following gem: "A contemporary commenting on 'Clara Belle's' the fashion writer's statement that 'during the coming season ladies will wear nothing but longitudinally striped hose,' observes, 'The printer must have overlooked her copy describing her other apparel.'" But most interestingly of all, this 1881 newspaper pre-dates Modjeska moving into and expanding the house. 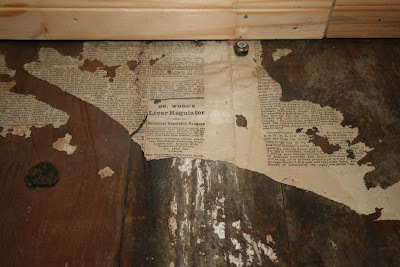 These papers were most likely put in place by "Judge" Joseph Edward Pleasants, who had owned the property previously. This will be blasphemy to some, but I personally find Judge Pleasants a more interesting local historical figure than Modjeska. 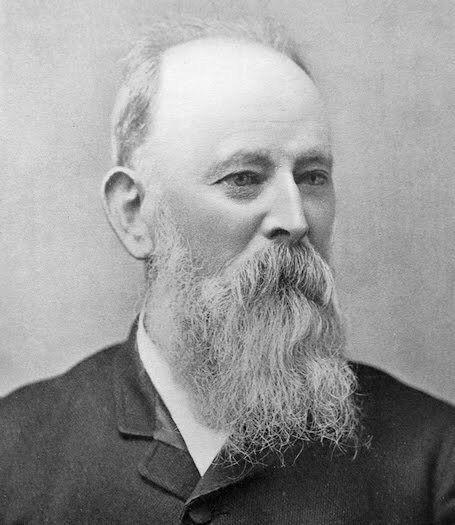 A true Orange County pioneer, he moved to the Santa Ana Mountains a few years after his first visit to the area in 1859 and he never left. As well as being one of the first white settlers in that area, he became the foreman for William Wolfskill's ranch, conducted the first recorded bear hunt in Orange County, helped found the first Orange County Fair Association, judged horse races (hence his honorific), kept bees, and was one of the first members of the Orange County Historical Society. Much, much more can be said about Pleasants, but that's a whole 'nuther post. This second newspaper remnant proved to have a bit less wow factor, but was fun to puzzle out anyway. First, I found a reference to U.S. Senate Sergeant at Arms Richard J. Bright, who served in that position from 1879 to 1883. Another article mentioned that the U.S. Census was running out of money, so that put it around 1880. But the article about James B. Doyle being sentenced to ten years in prison for bond forgery pinned down the date to late June or early July of 1881. It will be interesting, as I go through the rest of these papers, to see if all of them are from Summer 1881 or not, and whether they contain any local news. If I find other cool stuff in Madame Modjeska's closet, I'll let you know. 1) The Heritage Museum of Orange County (that's the place with the Kellogg House, dontchaknow) is now on Facebook. Go friend the heck out of them! 2) The Nixon Foundation is now offering a blog to help you keep up with all things Nixony. 3) The Orange County History group on Flickr now has over 4,000 images. 4) Both the Seal Beach Historical Society and the Orange County Mexican American Historical Society seem to have completely given up on their respective websites. If you know about new URLs for these groups, please let me know and I will update accordingly. 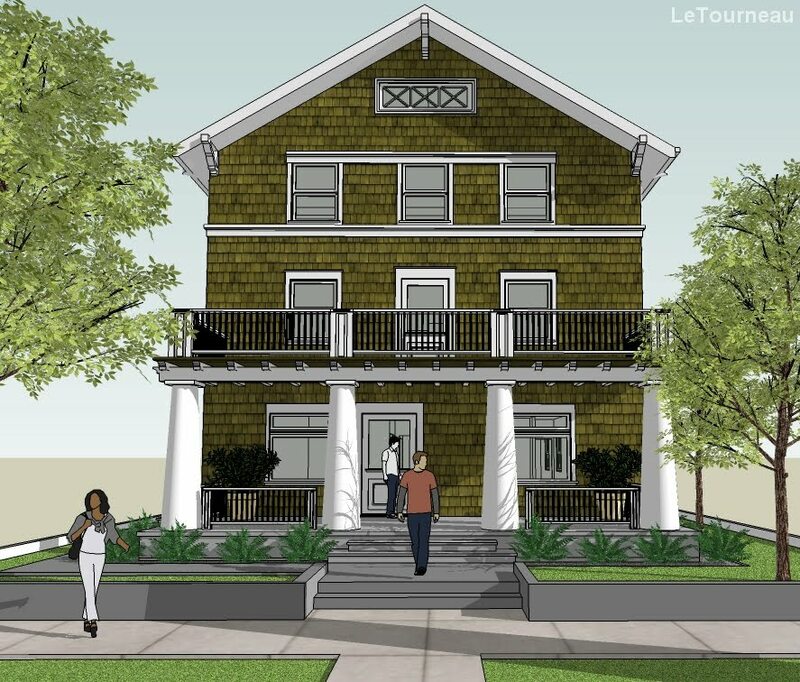 5) I also added a link to the Muckenthaler Cultural Center in Fullerton. If you know about other sites I should link to, or have other updates for the ol' Roundup, please let me know. Your comments are appreciated. 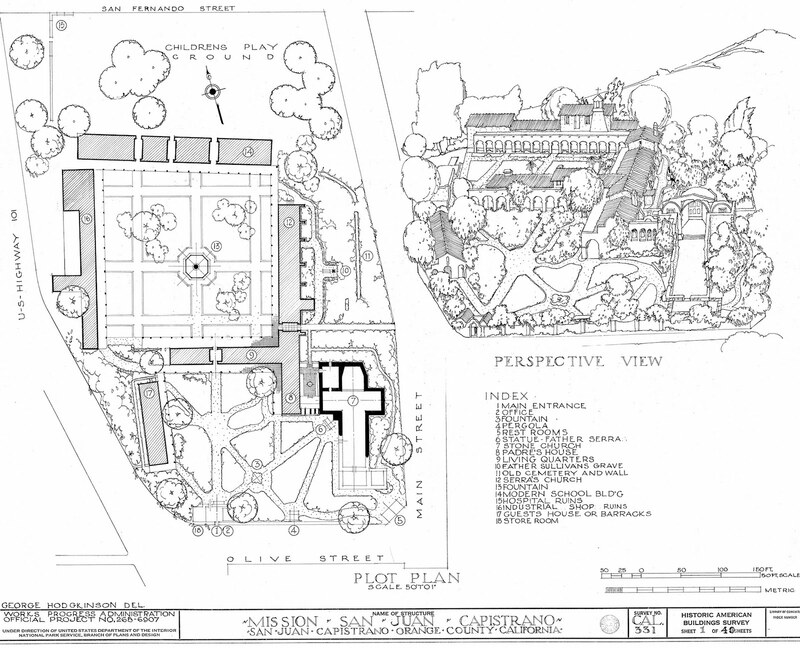 This is the plot plan for Mission San Juan Capistrano created as part of a Works Progress Administration's Historic American Buildings Survey (HABS), back in the 1930s. 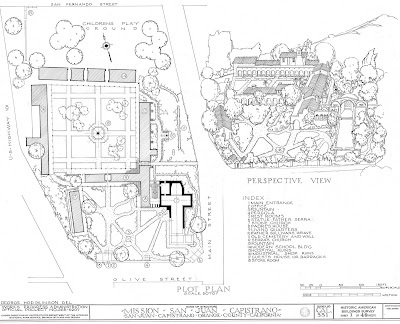 This image, along with many other drawings and photos of the Mission, are available on the Library of Congress' website. In fact, the HABS section of their site has this kind of detailed information for thousands and thousands of historic structures all over America. Other Orange County HABS surveys were done in Huntington Beach, Santa Ana, Tustin, Newport Beach, Laguna Beach, Anaheim, and Irvine. Speaking of Capistrano, right now, the Mission is featuring an exhibit entitled, "Mission Treasures: Historical Collection Revealed." The exhibit includes historic artifacts from the Mission that have not been seen in decades, including rare paintings, religious artifacts, and documents related to the Mission's history. The exhibit runs through Sept. 5th, and is open daily, 10am-5pm. The Santa Ana Historic Preservation Society has presented their 2011 Preservation Award to the Boukai family. I'm sad to report that the Placentia Library's history room now has extremely limited hours. It's best to call and make an appointment if you want to go in and do research. On a positive note, the Friends of the Santa Ana Library have purchased a microfilm machine for the Santa Ana History Room, so historians can get back to digging through the old newspapers. Of course, that collection also has short hours these days, so be sure to check their website to see when they're open. And finally, a reminder that you can still see the exhibit, "On Location: Orange County in Silent Film," at the Old Orange County Courthouse, 211 W. Santa Ana Blvd., Santa Ana, from 9am to 5pm, Monday through Friday, until Aug. 5th. It's free to the public. Just when you thought there were no exciting early photos of Fountain Valley,... I bring you.... mud. 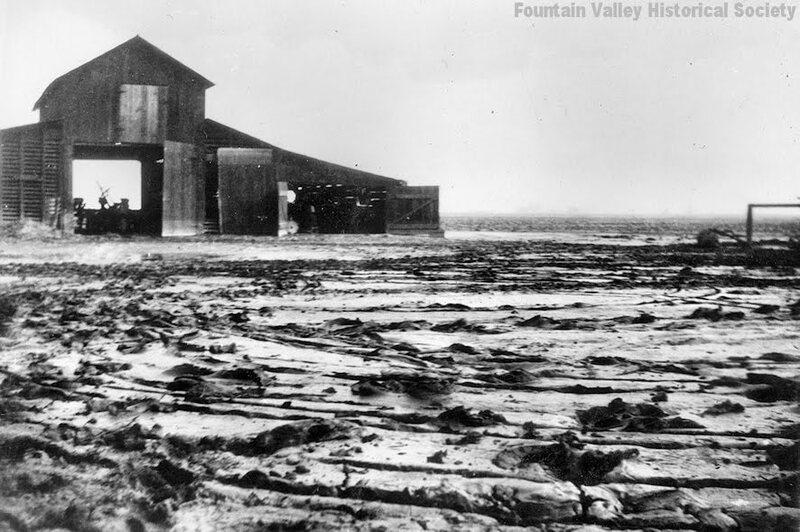 This image shows the aftermath of the 1916 flood on the area surrounding Talbert. It's just miles and miles of mud. This particluar patch of red river silt, in the foreground, was near the corner of Magnolia Ave. and Heil St, and was a foot deep. Note the highwater mark on the barn. My thanks to Dann Gibb for his continual help with all things Fountain Valley. I can't wait to see your O.C. Fair submission this year, Dann. It'll be hard to beat your earlier entries. The rabbit foot collection (mounted to a model of a Mongol horseman) and your dad's jar of "prison soap carvings" were particular favorites. 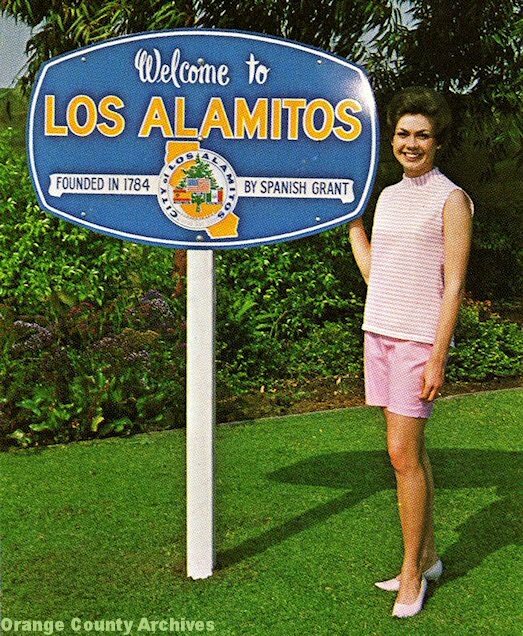 Blogger Larry Strawther has started what he calls the Los Alamitos-Rossmoor History Project, featuring a wide variety of articles about the area's past. He emailed me about this new site awhile ago, but I lost the message (along with all my other email) when my hard drive crashed. Anyway, mosey on over and check it out. Today's image comes from an old City of Los Alamitos promotional brochure. They take a bit of liberty in declaring their city "founded" with the first "Spanish Grant" in 1784. The town sprang up in the late 1890s, supporting the nearby sugar factory. The city wasn't incorporated until 1960. Also, as we historical folk like to point out, there were no actual Spanish land grants. Grazing rights might be granted for a particular area, but the King of Spain owned all Spanish territory. (In 1784, retired soldier Manuel Nieto was given such rights on land that included the Los Alamitos area.) It wasn't until the Mexican government was in charge that California land was actually granted to citizens. That said, I do like the jaunty, hand-painted, "Welcome to," part of the sign. And it's interesting that they chose a more motherly, less cheese-cakey woman to stand next to their sign. Whether that was planned or not, it certainly fit the family-friendly middle-class vibe Orange County exuded in the middle part of the 20th Century. 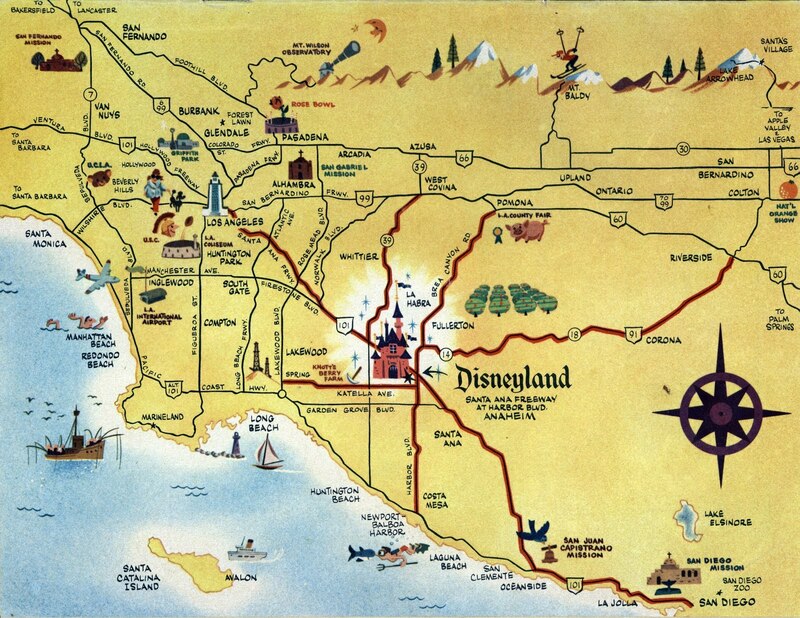 Today is Disneyland's 56th birthday. The image above was shot for an issue of the Orange County Industrial News -- a spine-tingling read to be sure -- and shows the airport coach (a 1957 or 1958 Chrysler Saratoga) at the Disneyland Hotel. I'm guessing the year was 1958 or so. I'm sure Mr. Ballard will be along shortly to fill us in on details. One more Disneyland historical note: Sam Perricone, the long time owner of Main Street's Citrus House, has passed away. Link out for details. Casa Romantica is hosting an exhibit on the history of fishing in San Clemente through Aug. 14th. A Register article about some of that history will give you a head start before you go. My grandfather loved fishing in San Clemente on vacations in the 1940s and '50s. These were my family's first encounters with Orange County. Personally, I prefer not to meet critters I plan to eat until they're on display in plastic wrap at the supermarket. Sunday will be the 56th Anniversary of the opening of Disneyland. 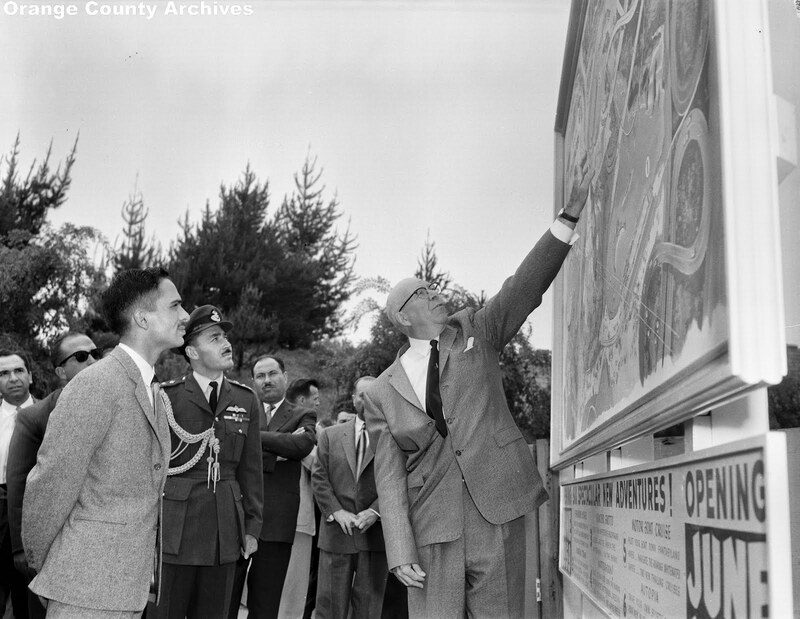 Instead of another photo of Walt, the image above shows Admiral Joe Fowler, showing a signboard full of coming Disneyland attractions to King Hussein of Jordan in April 1959. 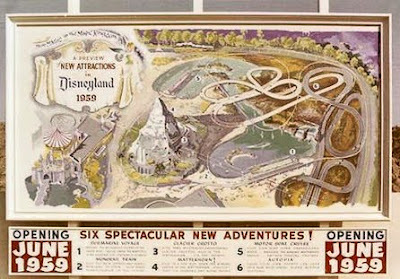 Additions that opened that summer included the Monorail, the Submarines, and the Matterhorn. A color image of the same signboard can be seen below. (I think I snagged the color one from an eBay auction at some point.) A clearer version can be found on Flickr. Rear Admiral Joseph W. Fowler (1894-1993) had a distinguished career in the U.S. Navy and was in charge of the naval shipyard in San Francisco during WWII. During the planning phases for Disneyland, it was felt that a naval expert was needed to help build the Mark Twain steamboat. Disneyland Vice President and General Manager C.V. Wood, Jr. contacted the retired admiral. Not only did Fowler get the job, but he also got the job of supervising the construction of the entire theme park. Some years later, he was given the same task at Walt Disney World in Florida. He also, beginning at age 87, worked on Epcot Center. The dry dock for the Mark Twain and sailing ship Columbia is still known as "Fowler's Harbor." It seems King Hussein's first visit to Anaheim in 1959 went pretty smoothly. A return trip to Disneyland in 1981, with Queen Noor and their two young sons, was a bit rockier as a park guest innocently blew past the large security detail and shook hands with the King. 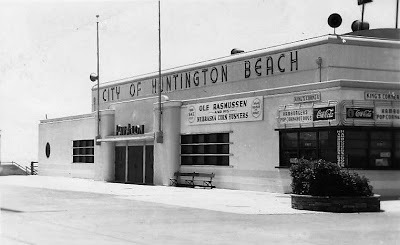 I'm having too much fun with the old photos of the Huntington Beach Pavalon that I stumbled across on eBay. This one is from about 1947, and the band playing is George Laughlin and the Melody Crew. Details on this local band are hard to come by. 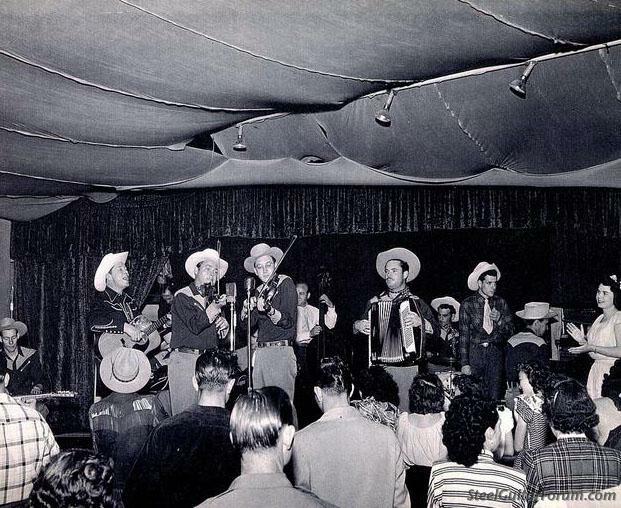 In 1958, Laughlin played with both of his bands -- the Melody Crew AND the Millionaires -- at an event at the Disneyland Hotel. By 1964 he was both the owner and the maitre d' of a restaurant and nightclub called Million-Aires, on West Chapman Ave. in Orange. Not surprisingly, the Millionaires were the house band at Million-Aires, and the versatile Mr. Laughlin sat in on drums. In a strange twist, there is now another band called the Millionaires based in Orange County. The new Millionaires is a group of young girls from Huntington Beach who play something the Interweb describes as "explicit electropop." I'm guessing I'd like the old Millionaires better than the new ones. 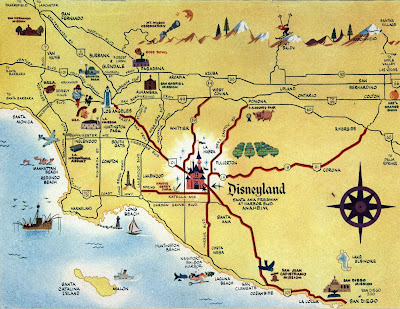 This fanciful map comes from a 1960 issue of Vacationland magazine. I have to admit, I don't remember where I got this image (mea culpa!) but I really wanted to share it here. The Santiago Orange Growers Association (SOGA) started out in 1893 and closed up shop in 1965. 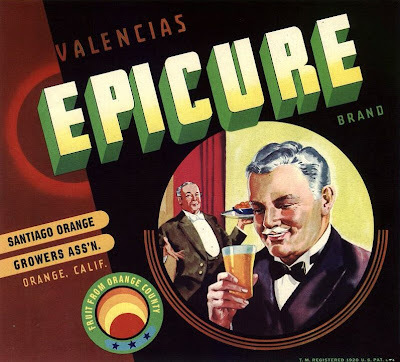 Their brands included Epicure (their "choice" label, shown above), SS (an unfortunate moniker), Everite, Planet, Scepter, Cardinal, and Progressive. SOGA's packing house was in Orange, and was eventually purchased by Villa Park Orchards Association. For a bit more about SOGA, see my post from 3-27-2010. Speaking of oranges, Stan Oftelie's new Orange County history book for children, Nothing Rhymes With Orange, is now available through Amazon. Stan's unique approach seems a lot less dry than most earlier attempts at this kind of book. He makes the subject relevant and readable for children without talking down to them. Hopefully, this book will serve as a "gateway drug" to many future Orange County history addicts. Gotta get 'em hooked while they're young! Now I'm off to Marie Callender's for dinner and a slice of pie. Hope they're still there! 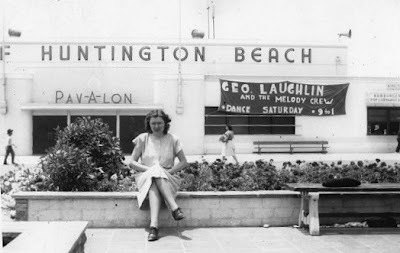 It's always a good time to visit the Pavalon in Huntington Beach. Well, actually, now would be a bad time, since it's gone. (Duke's is now located in a new building at that location, at the foot of the pier.) But here's a nice late-1940s photo of the Pavalon anyway. I found the image on eBay. Sorry these posts are a little thin, folks. I've been writing a long article for the forthcoming Orange Countiana (Vol. 7), and it's eating some of my spare time. I'm enjoying the chance to tell a story in more depth and do more original research. But I'm also a little more anxious than usual about doing this right, because I'll be sharing the pages of Vol. 7 with historians I greatly respect. Anyway, I think you'll find the subject interesting, even if it's obvious that I'm the new kid among practiced pros. 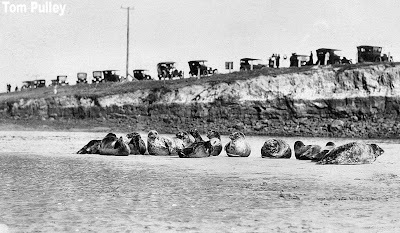 And you thought there we no seals in Seal Beach! 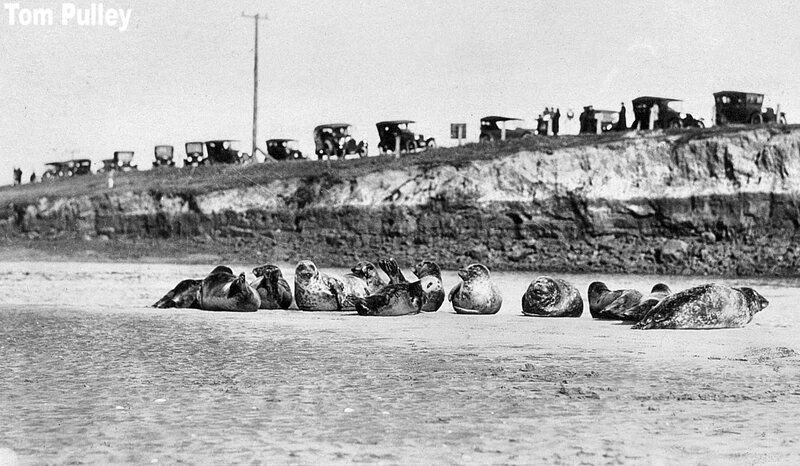 This photo is from about 1921. Drum majorettes wait for the milkman to dole out ice cream cups and sporks. The local Shriners are working the barbeques (which still stand today) in the background. And to go with the burgers and hot dogs, there are Cokes (in glass bottles) and Laura Scudders potato chips. Among the crowd are the various equestrians, still in their "Wild West" and "Old Mexico" costumes. And of course, on the horizon, are the ever-present Huntington Beach oil derricks. The ice cream was from Excelsior Creamery, which also had a big floral float in the parade to carry "Queen" Joanne Morrison of Santa Ana College, and her "Princesses," Pat Calloway, Diana Charlton, Darlene Higgins (daughter of pioneer surfer Bud Higgins), Betty Jones, and Marilyn Kamphefner. The parade's theme was a tribute to those serving in the Korean War. Both the El Toro Marine Band and the U.S. Naval Recruiting Band from San Diego marched and played the length of the parade route. Admiral Wilder Baker was the military grand marshal. All told, there were 300 units in the parade. 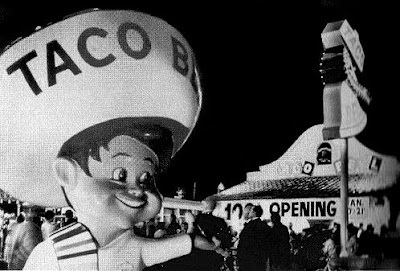 It was followed by a bathing beauty contest at the foot of the pier, the aforementioned picnic in Lake Park, a horse show at Tom Talbert's race track, and a fireworks show launched off the end of the pier. I hope you enjoy an all-American Independence Day celebration in your own community this year. 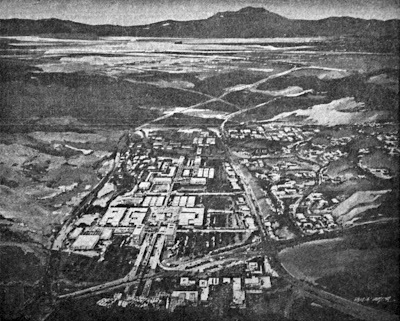 Today's image comes from the 3-11-1968 issue of the Laguna News-Post. 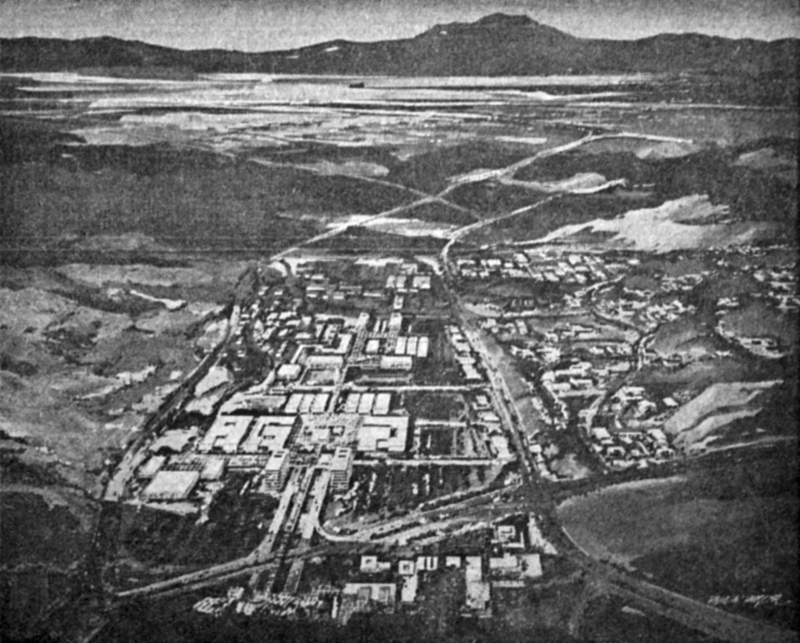 It's an artist's concept of the forthcoming North American Rockwell aerospace plant in Laguna Niguel, which was to employ 7,500 people. (It's a fuzzy image, and it's not all that old -- But how often do I have opportunities to showcase Laguna Niguel?) If built as shown above, it would have been the biggest electronics plant in the world. But shortly after this image was created, the aerospace industry hit a downturn, with both the space program and the Vietnam War ramping down. Plans for the plant were changed, and we ended up with the William Pereira-designed "Ziggurat" building we all know today. But even that iconic building had to be sold as soon as it was completed, around 1970. After some horse-trading, the government ended up with this strange landmark, which became known as the Chet Holifield Federal Building in 1978. Today, it houses offices for the IRS, Homeland Security, and other popular agencies. Until recently, it also housed the Pacific Region branch of the National Archives, which were recently moved to Perris, where they're less likely to be bothered by pesky patrons. The Orange County Historical Commission is hosting three days of how-to workshops on "living history" later this month. It will begin with a two-day intensive training entitled, "What is Living History: Techniques to Bring History to Life" on July 14 & 15, 9am to 4pm at Heritage Hill Historical Park in El Toro. On Saturday, a class entitled “Past Voices, Present Faces” will be held at the Old Orange County Courthouse in Santa Ana. The instructor will be John C.F. Luzader, V.P. of Programs for the National Association for Interpretation. He is also a principal with Living Museums of the West, a historical consultant, and an actor. For more information, contact Sue McIntire at (949) 923-2231. 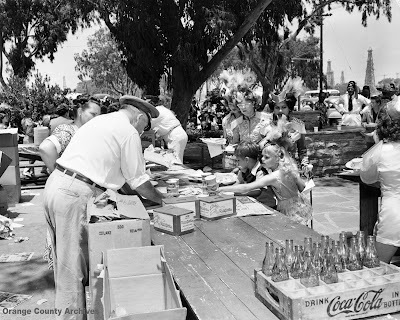 The Voice of OC recently posted an article about the history and development of parks in Orange County. It's very interesting, and I learned a number of things from it. Link on over.